In the 1930s marine chronometer production in Germany was centred on Hamburg and Glashütte-bei-Dresden. German watchmaking had originated in the small town of Glashütte and by 1934 was in difficulties. The armed forces had been a significant buyer of high-class chronometers prior to the First World War, but the loss of the German Navy following the war had led to a sharp decrease in demand. The town Council proposed a programme to make 500 instruments over five years and in July 1935 a meeting was held in Berlin involving the ministries of war, transport, education and aviation, with input from the mechanical and optical manufacturers and Deutsches Seewarte (the German Naval Observatory). This led to the German armed forces being directed to survey their holdings of chronometers and to their scrapping about 65 percent of mainly English chronometers. Arthur Lange and Son developed their Normal-Chronometer, a classical marine chronometer with spring detent, fusee and chain. This gave way in about 1940 to the design of the Deutsche-Einheits-chronometer or German Standard Chronometer which went into production by Gehard Wempe of Hamburg, who had taken over Hamburger Chronometerwerke GmbH from the ship builders of the city in 1938. Wempe began production of the Einheits-chronometer in 1942 in association with A Lange and Son. Production of parts was divided between the two firms. In all, about 2750 were made, presumably with serial numbers not starting at 1, as I am the guardian of number 3018. At the end of the Second World War, Glashütte was under Soviet control and was obliged to make 250 chronometers for the Soviets as reparations, as well as providing a full set of drawings for the Einheits chronometer, which allowed production of the identical Soviet MX6 in Moscow. Then chronometer making was resurrected in 1951 in a nationalised firm termed VEB Glashütter Uhrenbetriebe (People’s Clock-making Company), formed mainly from A. Lange and Son and Mühle and Son. This company resumed making chronometers to a pre-war design which differed in a few respects from the Einheits-chronometer and the Soviet MX6. Production ceased probably in 1978, before re-unification of Germany. Early dials gave the full information shown in Figure 1, while later ones had simply Glashütte in the centre (Figure 2) though the GUB stamp continued to be marked on the upper plate. Figure 3: Condition of the plates as found. …while Figure 4 shows the state of one of the balance pivots. Everywhere, the oil had dried to the consistency of a hard soap. Figure 4: Dirty balance pivot. Careful cleaning of the plates resurrected them enough to make the maker’s mark readable on the top plate (Figure 5). In restoring the much corroded and scratched plates, I tried to compromise between removing scratches and preserving the once-beautiful decoration. Practically all makers decorated the plates in some way, even in times of war, and even though they would normally only be seen at overhaul by the chronometer maker. This was true of the Einheits-chronometer, even when economies were being made by making the bowls of black Bakelite. Figure 5: Maker’s mark (GUB Glashütte/SA). Figure 6 shows the completed cleaning. I was not able to remove some stubborn finger prints without risking the decoration. The Einheitschronometer and MX6 had only three pillars with their positions shown by white circles in Figure 7, whereas the GUB version and its pre-war predecessor had four. The position of the extra pillar is shown by a black circle and Figure 8 shows on the left how the attaching screw also secures the barrel plate. In the other chronometers, the the top plate is threaded for screws that attach the barrel plate to it. Figure 7: Position of pillar holes (MX6). During WW II, some German chronometers were fitted with a steel band made by Sandvik of Sweden instead of the traditional chain. I have alluded to possible reasons for this in Post number 27, in which I describe substituting flexible steel cable for a chain. It is possible that in post-war East Germany, the craft skills for chain making simply did not exist. The band, 730 mm between the bights of the hooks, is shown in Figure 9, and is approximately 0.2 mm² in cross section. Figure 9: Driving band and hooks. Figure 10 shows the band in place on the barrel. Fitting it can be difficult as, unlike a chain, it cannot simply be wound on to the fusee and left there prior to attaching it to the barrel, on account of its springiness. It has to be wound on to the fusee with the latter in place between the plates and, while maintaining tension on it, the barrel is put into place, the hook attached and the barrel rotated to take up the tension and its click engaged. Before working out how to fit the band, I despaired a little and instead fitted a chain, only to find that the height of the chain meant that it fouled a head of the screw that attaches the stop work to the top plate before the final turn. As a result, the chronometer could be wound only to 48 hours instead of the usual 56 hours. Figure 10: Driving band in place. 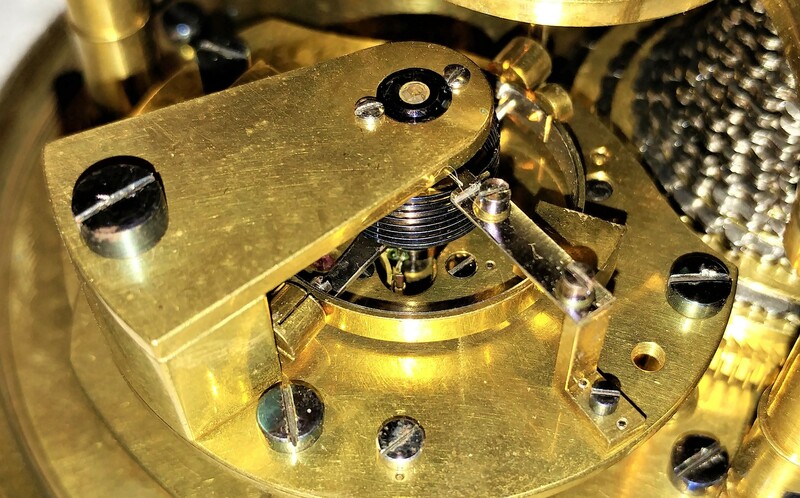 The stop work for all but very early Einheits-chronometers and the MX6 is incorporated into the top of the fusee in the form of a transverse rectangular bar which can slide out of the fusee against a spring load. As the chain reaches the top of the fusee, it presses on one end of the bar to make the other end of the bar project, and this end then encounters a stout pin projecting from the underside of the top plate, bringing winding to a halt. The GUB chronometer, however, uses Geneva or “star wheel” stop work, which is shown exposed in Figure 11. 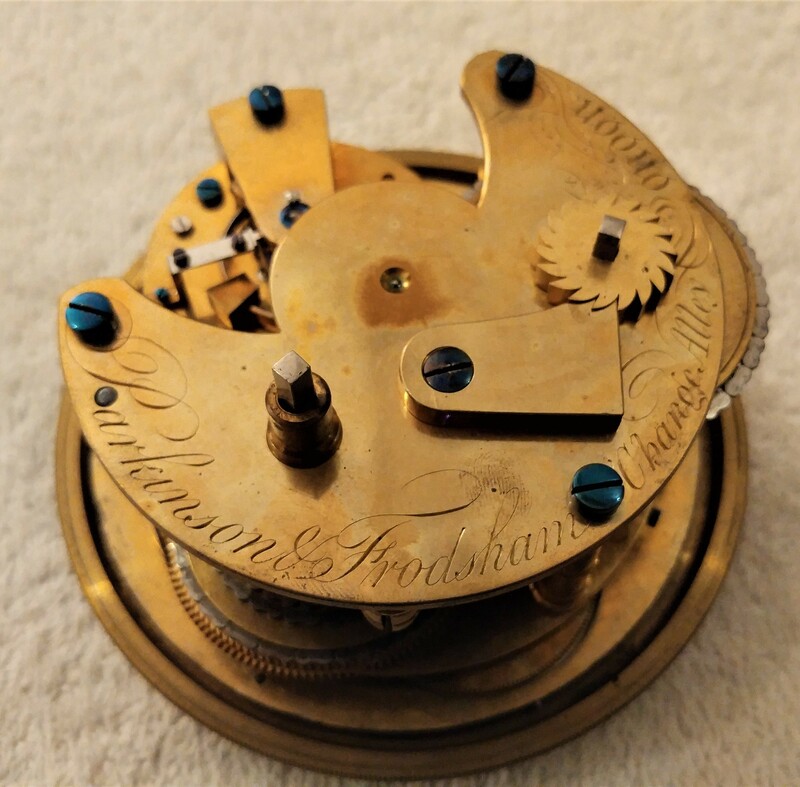 As the fusee rotates, a pin projecting from its top engages with the star wheel and makes it rotates through part of a revolution until eventually it buts against the part where there is no gap between the “teeth” and prevents further rotation. A leaf spring prevents unwanted rotation due, say, to vibration. I have illustrated a slightly different form of this mechanism in Figure 7 of Post number 20. Figure 11: Geneva stop work. 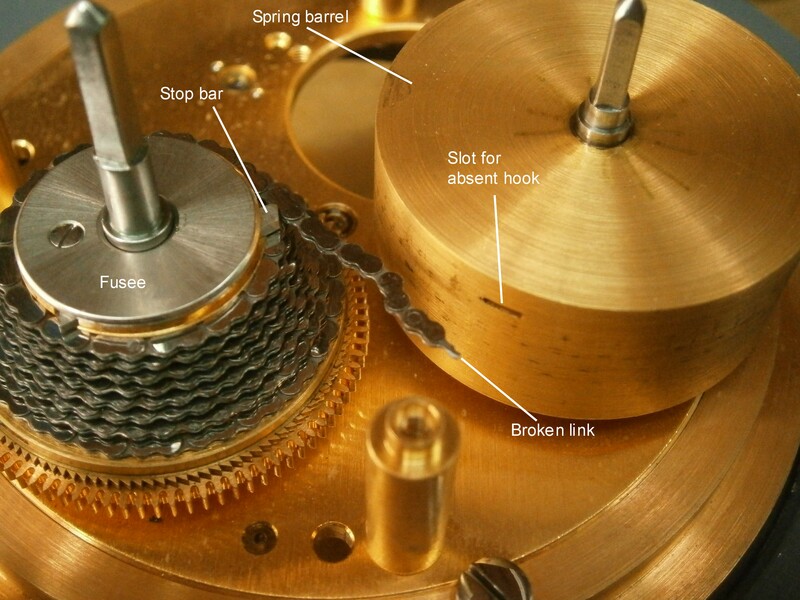 Figure 12 shows the stop work in place and the screw head that prevented the final turn of the fusee. When fitting the driving band, and before fitting the top plate, the star wheel should be rotated so that the fusee can engage with a gap in the wheel and so that fusee can make all its turns. The top plate is then assembled, the fourth wheel blocked and the fusee hook engaged with the fusee, which is then wound while feeding in the band under tension, as described above. Figure 12: Stop work in place. I found the detent a little difficult to fit, as the foot of the support block lies partly behind a pillar (Figure 13), unlike the other chronometers where the foot is clear of the the pillar, as shown boxed in red in Figure 7. I found it easiest to invert the movement so the top plate is horizontal and then to tease one steady pin of the support block into place, having first roughly aligned the axis of the detent with the balance staff and rollers. Another difference in the detent is that it cannot slide axially on the support block, as its steady pins engage in holes rather than in a slot, meaning that the depth of engagement with the discharge roller is fixed. The chronometer reached me with only the bowl and gimbals. The finish of the ring and brackets is very good compared to that of the MX6, which is, to borrow the words of an Australian friend, a little agricultural, referring to the finish of agricultural machinery. As there was no case, I had to make my own from a very battered old desk, using a mixture of MX6 and home-made brass furniture. The corners have mitre joints which are relatively weak, but when provided with keys and using modern glue, they are almost indestructible (Figure 15). Figure 15: Cross section of keyed mitre joint. The final result is shown in Figure 16. These chronometers were not brass bound, nor were they supplied with a top lid, which often were in any event removed and lost. The pivots of the balance staff on close inspection, were slightly worn and the upper pivot of the escape wheel was broken. I elected to accept the former and repair the latter using a muff, but found the rate irregular, sometimes to the tune of two seconds a day, so eventually I bit the bullet and made a new balance staff. So far, the variation in rate seems to have improved. 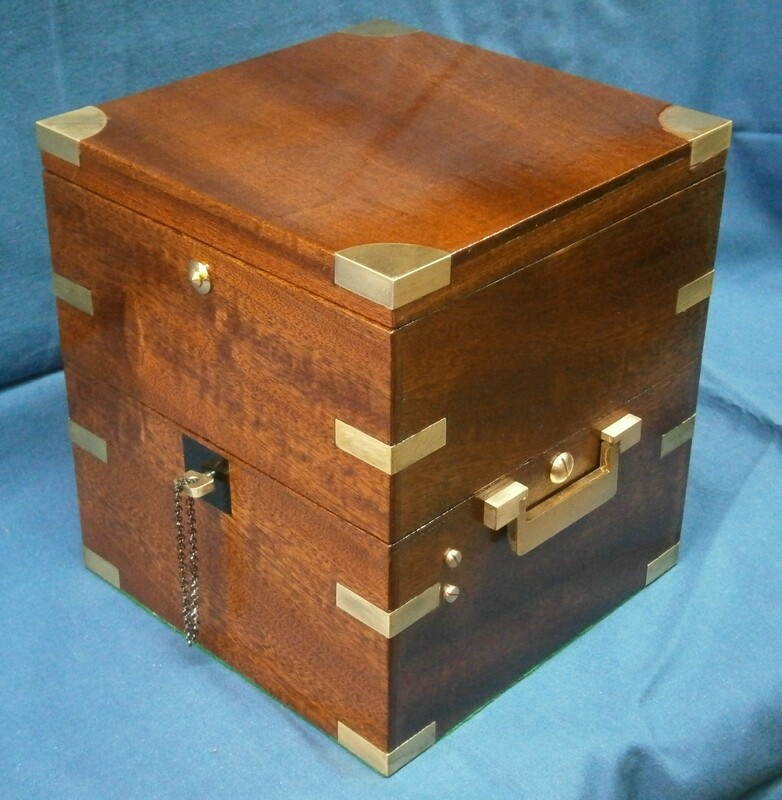 Figure 16: Chronometer in its case. I found Das Deutsche Einheits-Chronometer (Altmeppen, J. and Dittrich, H., Kinnigswinter, 2012) very informative on the history of Glashütte and highly recommend it as a source of information, even for those who, like me, struggle to read German. A little over two years ago I wrote on how I set about making a spring detent for a Soviet era MX6 chronometer by using mainly machining methods (Post 22 of 20th June 2016). I had to make the spring by filing and, after re-reading an account of how V.E. Van Heusen had mass-produced detents for the Hamilton M21 chronometer during WW II* it occurred to me that it is very unlikely that he produced the springs by filing. Indeed, it seemed to me that the only practicable way of making the springs in qualtity was by surface grinding. This involves passing a rigidly held workpiece beneath a grinding wheel and decreasing the distance between them by finely controlled increments until the desired thickness is reached. The design of the M21 detent is such as to make this relatively easy, as it is feasible for one side of the spring to be supported while the other side is reduced to the correct thickness (Figure 1). This is not true of most spring detents, including that of the German Einheits-Chronometer (Figure 2) and the Soviet MX6 which is a very close copy of it. Figure 1: Part-finished M21 detent (Courtesy of Tim White). Figure 2: Drawing of Einheits-Chronometer detent. Figure 3 shows a sectional drawing of the MX6 detent rather more clearly. If one side of the spring is ground and the detent is simply turned over to grind the other side and reduce it to thickness, the spring is unsupported in the middle part so is likely to flex against the cutting forces. Figure 3: MX6 detent section. Spring (green) not to scale. A few weeks ago, I set out to see if I could produce a detent with a spring ground to size and emulate manufacturers who presumably did not have an old gentleman sitting at a bench patiently filing away day after day, at least not in the 20th century. The problem resolved itself into producing a simple jig to hold the machined detent securely while each side of the spring was ground. Figure 4 is an un-dimensioned drawing. For those not used to seeing engineering drawings, the top drawing is a plan view and the bottom a side view. The surface destined to support the spring I have shaded in green and the slot to accommodate the pipe of the detent is in red. It is a simple matter to make the jig, starting by milling the bottom flat, drilling the two fixing holes and securing it to a hunk of cast iron that has been ground flat and parallel on both surfaces. Then the top is machined all over. When milling the detent I had left the bottom surface of the spring a measured 0.35 mm below the level of the foot and taken 0.2 mm off the top surface, leaving an allowance for grinding of just under 0.2 mm, about the maximum that could be milled without distorting the spring, which was supported only at the ends and one side. Thus, after milling the top of the jig, I had to lower the cutter 0.35 mm to do the rest, followed by a further 1.5 mm to cut the slot for the pipe. Figure 5 shows the jig against the partly milled detent, still attached to its parent metal. Figure 5: Jig against detent-to-be. Once freed from its parent metal it was a simple matter to attach the detent to the jig with flake shellac, by heating the jig on an upended domestic iron, melting on some shellac and holding down the detent while the shellac cooled (off the iron, of course). I had hoped it would be a simple matter then to screw the jig to the cast iron block, trim a grinding wheel to a thickness of 5 mm and gradually reduce the spring to a thickness of 0.08 mm (Figure 6). It was not to be, as my horrible old Indian surface grinder refuses to do anything other than stick and slip when putting on cut, so my first attempt led to complete disappearance of the spring as a cut, put on by measuring with a dial gauge, suddenly increased as I passed the detent under the grinding wheel. Figure 6: Jig on surface grinder chuck. After remarking to myself how very unfortunate that was, I set about making an adapter to attach a small grinding head from my home-made Quorn tool and cutter grinder to the spindle of my light vertical milling machine, which has fine control over down movement of the quill. Making the adapter was a relatively simple turning exercise, but locking the spindle against rotation was not. However, I eventually succeeded, but in a moment of carelessness put on too much cut and ended with a spring a mere 0.02 mm thick. As making a detent involves annealing the metal to remove locked-in strains, and cutting and truing up a blank, before the detent can even begin to take shape, it takes me about three hours to mill one to shape, so I decided to leave grinding for another day. However, it did occur to me that the jig would allow me to hold the detent more securely when filing the spring, using my swing tool, so I made one more detent, which gave me an opportunity also to practice polishing. Figure 7 shows it in the swing tool. If you compare it to Figure 9 in post number 22, it will be apparent what I mean. Figure 7: Jig in swing tool. I am fairly sure that the procedure I have worked out to grind the spring is a workable one, and getting control of the grinding head downward movement is the nub of the problem, so I have not entirely given up the idea. It also occurs to me that attaching the jig to a piece of flat plate and screwing two hardened filing guides a few cm either side might allow reliable spring production by those without swing tools. Meanwhile, I have a spare detent, though it is not for sale… (Figure 8). There may well be machinists reading this who have much greater skill than I have and who may have faced and solved similar problems in the past. I hope they will not hesitate to contact me to put me wise. 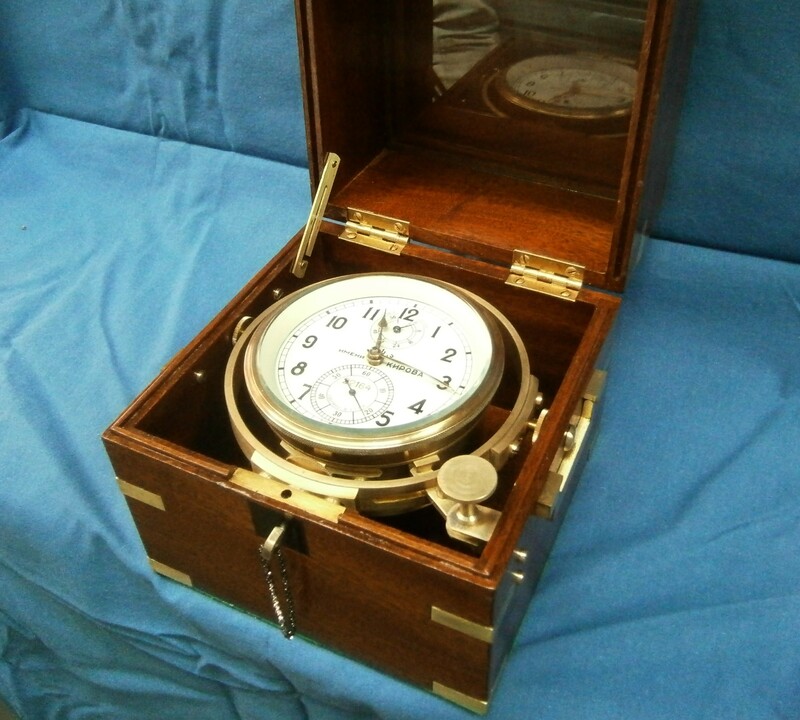 *NAWCC Watch & Clock Bulletin, January/February 2012: The Man Who Saved the Hamilton Model 21 Ship’s Chronometer. In post number 30, I described how I made a new escape wheel for a Hamilton Model 21 chronometer and alluded to several other problems to be solved. In this post I will give a brief account of them, followed by a description of how I managed to avoid sourcing and buying a new impulse jewel. As the latter is tiny and rather difficult to photograph without sophisticated equipment, I apologise in advance for the sometimes poor quality of the photos, though I think they convey the details they are intended to convey. As the fusee is one of the parts first to be removed, it revealed why I believe that the instrument had been dropped while out of its bowl (Figure 1). Figure 1: Damaged chain track of fusee. Near the top of the fusee, the walls of the chain track had been bent out of straight so that the chain was wedged in place. I gently eased the chain out of the track and then, using a small screw driver with all sharp edges stoned off, I persuaded the walls upright again and filed off tiny burrs with a fine Swiss file. The damage is no longer apparent. All of the pivots of the escape and balance wheels had been sheared off and the state of their hole jewels attested to the violence of the fall that had broken them (Figure 2). Figure 2: Destroyed hole stone of balance. The plate jewels in the M21 chronometer are friction fitted into the plates and the throat of a staking set of normal size with the usual fitment for pressing jewels into place is generally too small to allow it to be used for a chronometer, so improvisation is needed to achieve a controlled pressure. I fitted the end stones first and then by careful and repeated measurement tapped the hole jewels into place with a brass drift until they were a scant 0.02 mm from touching the end stones. The official manual writes that they should be pressed into contact with the end stone, but it seemed to me that this might prevent the formation of an oil reservoir (if I am wrong, professionals please feel free to make a kindly worded comment). In retrospect I should probably have used a drift held in the tail stock of my small lathe as an improvised press with the plate resting on the face plate. I have described pivot repairs in posts numbers 6 and 7. In early M21 chronometers, the plates and the detent were made of nickel silver, a brass in which half of the zinc has been replaced by nickel to improve its mechanical and corrosion resistance properties. There is no silver in nickel silver, but it is a shiny white metal. Columbia Metals UK describes it thus: “Nickel silvers are capable of providing a unique combination of strength, high modulus spring properties, corrosion and oxidation resistance, …. and numerous other attributes combined with ease of forming, machining, plating and joining.” Later chronometers have detents of beryllium copper. Happily, in the disaster, which seems to have included running away of the movement, my detent was “bowed but not broken” and the passing spring had survived . The two photos merged into one of Figure 3 were taken on different days in obviously different lighting, but are of the same detent from different viewpoints. The top image shows the detent in its support block and the bend at the base of the spring is rather obvious. Less obvious in the lower image is that the bend is not symmetrical and has introduced a slight twist. Only a fragment of the locking jewel had survived. By this stage, I had removed the passing spring. A few words of warning may be useful here. The screw that secures the spring in place is the tiniest part in the whole chronometer and can easily be treated as a fragment of dirt and be lost, so it pays to store it safely in its own little container. I straightened the spring by drawing it between the rounded jaws of special pliers, as described in post number 28 and eventually restored it to straightness. In an effort to avoid expense which I can ill afford, I attempted to make a new locking stone of tungsten carbide, as described in post number 24, for a Soviet MX6 chronometer, but the M21 locking stone is rather more slender at only 0.6 mm in diameter (versus 0.8 mm) and vibration from the belt of my tool and cutter grinder (since remedied) was enough to break it off when I attempted to grind the flats. I was thus obliged to buy a new locking stone and fit it as described in post number 15. In early M21s the rollers were in one piece so that the mutual angles of the unlocking and impulse jewels was fixed, as in my example. Quite early on, the one-piece rollers were replaced by two separate parts. Figure 4 shows a view from a larger photo of the rollers from above, taken so I could replace them in their original position. Figure 4: Roller and jewels. At first sight, all appears well, but as repairs progressed I discovered that the impulse jewel was quite badly chipped, so much so that a “replace and hope for the best” attitude would have been a poor plan. Figure 5 shows the jewel after removal. Figure 5: Chipped impulse jewel. As I had not at that stage found a source of a new jewel, and doubted my ability to make a new one from tungsten carbide, I decided to reface it using a diamond file and laps, but first I had to devise a method of holding this tiny piece of synthetic ruby. I filed a notch into a scrap of 2 mm brass sheet using a warding file until the jewel fitted snugly, and then secured it in place by melting a flake of shellac over it (Figure 6). Figure 6: Impulse jewel set into holder. Note that this view shows that the damage extends quite a way down one edge of the jewel, so that in filing the new clearance the length of the jewel was quite considerably reduced. Looking through that most valuable of instruments, the retrospectoscope, I should have seated the chipped side in the holder and filed the new clearance on the other end. This would have maintained most of the length and made for a more secure re-fitting in the roller. A diamond file cut away the damaged face, much more easily than the same file cuts into tungsten carbide, and this underlines how much harder the latter is than ruby. As the clearance face comes into contact only with air, there was no need to achieve a very fine finish, but rather than leave a sharp edge, I rounded it a little with fine laps. 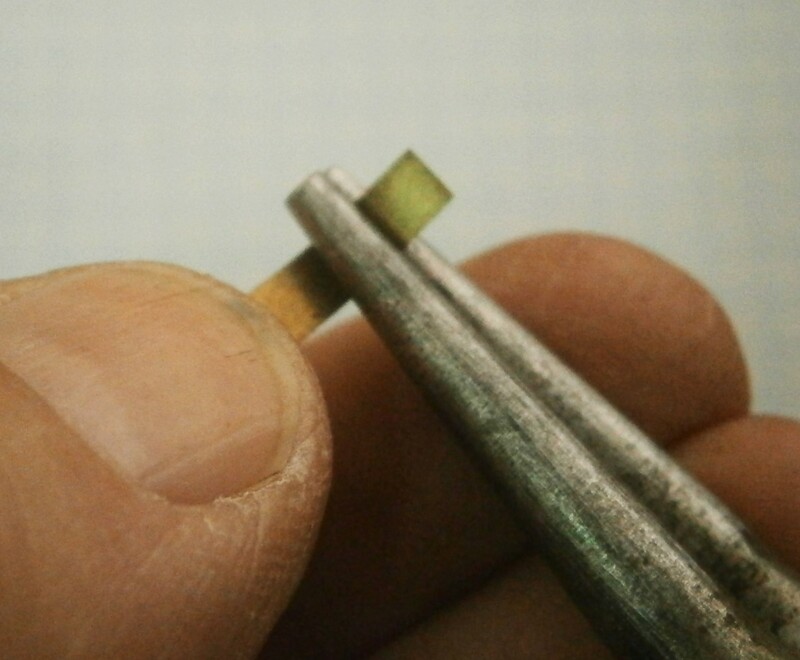 The roller is 6.35 mm (0.25 inch) in diameter, so another scrap of sheet brass with half of a 6.3 mm hole filed away provided the gauge to ensure that the tip of the jewel projected the correct length when being secured in place with melted flake shellac. This is described in post number 17. Figure 7 shows the final position. Although the hold of the roller on the impulse jewel looks precarious, the shellac covers the base of the stone and I have left fillets of shellac on either face. If it does eventually give way, I will replace it with a carbide version. Figure 7: Impulse jewel refitted. The rest of the overhaul was routine and the chronometer showed no reluctance to resume its ticking with a very good action. However, I will end with a cautionary tale. After about a week of rating it and finding that it had a very steady losing rate of about 1.7 seconds per day, its rate became erratic and then it lost two seconds overnight, so I stopped it and began to look for a source of the problem. As I was checking the balance and escape wheels for excessive end or side shake, the instrument suddenly declined to run at all. Suspecting that the impulse jewel had perhaps shifted, I removed the balance to check and found that it was still secure so I replaced the balance and turned my attention to the detent, to check what I already knew to be the case, that the escape wheel teeth were engaging about one third of the acting face of the locking jewel. The engagement was now much deeper. It was at this point that I discovered that, having at original assembly made a slight tweak to the depthing of the passing spring, I had failed to re-tighten the screw that holds the detent to the mounting block, labelled “detent clamp screw” in the original manual. Once I had tightened it, normal running resumed. Now I’m investigating its rate when half wound. 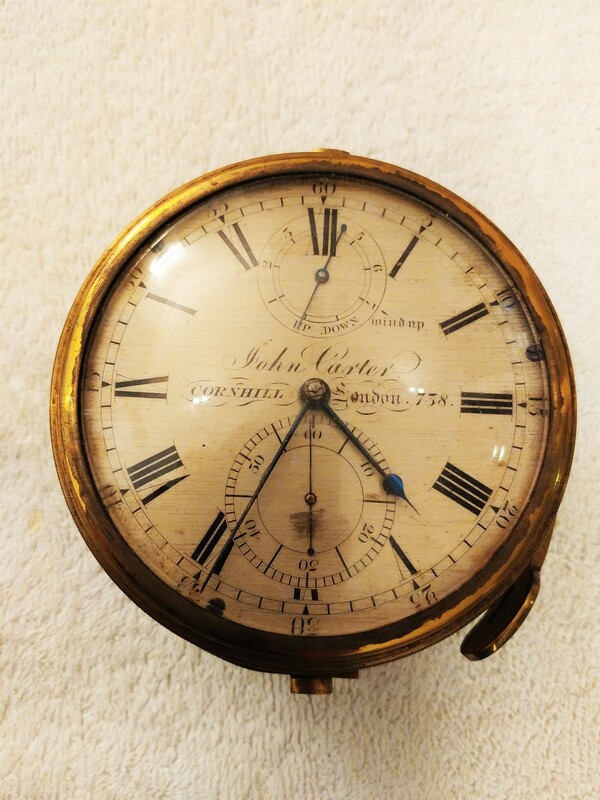 I recently acquired a damaged chronometer that seemed to have been dropped on to a hard surface while out of its bowl, or perhaps the owner had thrown it at a wall in frustration. At any rate, the walls of the fusee track had been squashed in at one point and had trapped the chain. By carefully using a small screwdriver whose edges had been rounded off, I was able to open out the track and a fine file removed all other traces of the injury to the fusee. On further inspection I found a large range of problems that would need to be fixed before the chronometer could be brought back to life, some of them probably due to the shock of the fall and others probably consequent on the initial damage. The most obvious was that all the pivots of the balance and escape wheels were broken, which I could fix, and two of the escapement hole jewels were shattered, which I could not, so I was committed to having to buy replacement jewels. In the Hamilton M21 chronometer, these jewels are friction fitted in the holes in the plates and so are rather more difficult to fit than those of most other chronometers. The locking jewel was broken off flush with the top of the detent, but happily, enough remained for me to be able to photograph, so that its expensive little replacement could be replaced at the correct angle of 8 to 12 degrees of draw. The detent spring was also bent out of shape, but I was able to straighten it using the method outlined in Post 28. 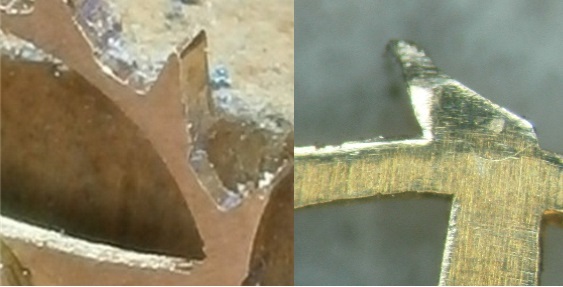 To the naked eye, the escape wheel looked fine, apart from the disaster to the pivots, but on closer inspection its teeth looked worn and when viewed under a low power microscope, the tips and sides of the teeth looked worn, as shown in Figure 1. Figure 1: Worn and damaged escape wheel teeth. Normally, only the tips and front faces of the teeth come into contact with anything, i.e. the locking jewel and the impulse jewel. Its manufactured diameter would have lain between 13.14 and 13.18 mm, but its measured diameter was only 12.73 mm, a relatively enormous disparity, so I guess that something had caused the escape wheel to “run away”, the while battering itself against a jewel, eventually breaking the locking jewel and, as I found later, badly chipping the impulse jewel. Perhaps, when the first escape wheel pivot broke, perhaps it was still able to run, albeit drunkenly, and so damage the sides of the teeth. I searched for a new escape wheel, but could not find one to buy. Most chronometer escape wheels seem to have fifteen or thirteen teeth, but Hamilton chose sixteen, so the readily available Soviet MX6 escape wheel (a bargain at US$ 235 with pinion?) could not be substituted. I had to bite the bullet and try to make one myself. A quick trawl of the internet showed that two people had made escape wheels by laboriously making a punch and a die, so that the wheel could be punched out of sheet metal with the dimensions and crossings all ready formed for machining the teeth. This method did not appeal to me, and anyway, for me part of the pleasure of restoring these instrument comes from using old techniques. A punch and die are fine if you want to make lots, and Hamilton eventually made over 11,000, but for a one-off, it seemed to me to be overkill. Figure 2 is a posed photograph of how to remove an escape wheel from its arbor. Figure 2: Removing wheel from arbor. Some makers start by cutting out or buying a circle of brass, mounting it on an arbor, turning it to size and then cutting the teeth. This works well with larger wheels, but because of the small size of the hole in the middle, this makes securing the blank a bit uncertain for turning and the set up lacks rigidity when it comes to cutting the teeth. I used the more wasteful but safer method of machining the teeth on brass rod and then parting off slices, so I could have several goes at developing my method. After turning the rod down to the outside diameter of 13.16 mm, I transferred the chuck from the lathe to my dividing head in a bid to retain concentricity. Figure 3 shows the faces of the teeth being cut. Figure 3: Cutting the front of the teeth. Although the photo shows the work piece in a three jaw chuck, I found that the set up would not hold concentricity between lathe and dividing head to any better than 0.03 mm, so I eventually used a four jaw chuck and centred the piece with a dial indicator against a register machined on the bar. To cut the teeth, I used a fly cutter filed from a piece of 6 mm silver steel and then hardened, tempered and polished on the cutting faces. Run at 1,500 r.p.m this gave an excellent finish that needed little polishing. Tools for cutting brass need to be sharp. Note that the acute angle of the teeth of about 60 degrees means that the front edge of the tool needs to be lowered below centre by just over 2mm. It was somewhat more difficult to machine the curved back faces of the teeth, but I eventually managed to file a radius of 2.5 mm on the end of a piece of silver steel and to form the all-important relief behind the cutting edge. Figure 3: Back faces of tooth being cut. Setting the tool height to get the tooth looking correct needs to be combined with rotating the work piece to get a tooth that is robust enough and to leave a narrow land at the top of the tooth, specified as 0.13 to 0.14 mm wide. Of course, this cannot be easily measured and for myself I modified that specification to be “land present and just about visible”. In this photograph of an early attempt, the land is a little too wide, but the form looks fine. If you take too much off, the diameter inevitably has to be reduced to restore the land. Most turners will agree that “Parting off is such sweet sorrow”. The tool needs to be sharp with its face square to its axis, and the axis has to be square to the axis of the lathe. The cutting edge needs to be exactly at centre height or, with a back tool post, a minute amount above. With the work piece transferred back to the lathe begins the task of parting off slices while ensuring that no slice is thinner than 1.32 mm. As the conditions above are difficult to meet exactly, it is better to part off oversize and then face the slices down to the desired thickness. Measuring small distances in a confined space is best not done with a ruler, and I use a depth micrometer, as shown in Figure 4. Parting off is easier if there is a central hole and I finally remembered to drill this before parting off. I then turned a holding fixture which would not leave the lathe until all the slices had been reduced to the correct thickness, though I eventually realised that Hamilton’s specifications and tolerances were to ensure interchangeability and that 0.1 mm either way was of little importance as long as it is no wider than the impulse roller. Figure 5 shows the simple fixture being bored to produce a recess 1 mm deep that would just accept a slice of embryo escape wheel. Knowing the depth of the recess from the outer shoulder, it was then possible to set a facing tool back from this shoulder, using the graduations on the tool slide, by an amount to give an over all thickness of 1.27 to 1.32 mm. At first, I used shellac to secure the wheel in place, but found that the fixture combined with the mass of the chuck formed such a large heat sink that it was difficult to reach a high enough temperature with a small flame, a problem not eased by relieving the end of the fixture with a deep slot, seen in some of the following photographs. Eventually, I used superglue. It melts at a much higher temperature than shellac, so I was obliged to remove the fixture from the lathe and soak it in acetone overnight to release the wheel. Having cemented the part into place and faced it to the correct thickness, the counter bore in the wheel can be started using an 8 mm end mill or slot drill, its depth controlled by the graduations on the tail stock quill. This counterbore is then opened out with a boring tool (Figure 7) to its correct depth and diameter. The correct diameter removes just a little of the root of the tooth to give the finish shown in Figure 8. To ensure concentricity of the hole in the centre and the tips of the teeth, I ran a small but rigid reamer, with one of its two end teeth ground back to make of it a small but rigid tool. A reamer is usually used to size a hole and will normally follow the existing hole, but in this case, only a whisker was removed, and in any case, the hole is too small for a conventional single point boring tool to enter. After giving it a good soak in acetone the wheel could be removed from the fixture so that marking out for the crossings could begin. I faced the ends of a piece of wooden dowel and glued to each end a piece of emery paper, one of 800 and one of 1200 grit and rotated the dowel against the floor of the counterbore to remove most of the turning marks prior to marking out. In a scrap of brass, I faced, drilled and reamed a 3 mm hole and made a close fitting removable spigot, one end of which was turned down to a close fit in the hole. Before parting off the spigot I made a minute centre mark in it with a sewing needle held in the tailstock chuck (Figure 9). Figure 9: Marking out jig. From this centre I scribed a circle of radius of about 18 mm and divided it into 6 parts by the well-known method of stepping the dividers around it at the same radius. I marked out centres on three of the radii at a radius of 13 mm and from these centres scribed the outlines of the spokes, adjusting the radius by trial and error to give sufficient metal at the joining of the spokes with the periphery, which has a radius of about 5.5 mm. Midway between the spokes and the periphery I made punch marks and then removed the wheel from the jig to drill 2 mm holes at these points. Figure 10 shows a wheel at this stage. Figure 10: Ready for crossing out. The purpose of the holes is to allow entry for the blade of a piercing saw, in this case a new 4/0 blade, but before beginning to saw, some filing makes subsequent sawing and filing much easier. I long ago made myself a mini four square file by grinding away two adjacent sides to make safe edges and I used it to file in and out to the marked lines, so the the saw could start right next to the line (Figure 11). Figure 11: Preliminary filing to lines. The wheel is much too fragile to be held in a vice and Figure 11 shows how it is held horizontally between fingers and a horizontal surface while the file moves up and down. It helps greatly to be able to see exactly where the file (or saw blade) is going and I have a binocular microscope mounted on a boom on my work bench. Note too the piece of leather between my fingers and the wheel. The teeth of the wheel by this stage are sharp! A later photo (Figure 13) taken before this one shows my fingers before I learned this important lesson. Figure 12 shows a wheel prior to sawing. Figure 12: Preliminary filing completed. Sawing could now commence, again holding the wheel horizontal, as is usual when using a piercing saw (Figure 13). The saw “table” is simply a strip of metal cantilevered from a small vice to give the hand room to move up and down beneath it, and the wheel is rotated to keep the blade tangential to any curve as the cut progresses. When progressing around tight curves or into corners, the blade must be near-vertical, but around shallow curves or in straight lines the blade seems to follow the lines better if canted forwards a little, as shown in the figure. Figure 13: Crossing out with saw. It will, I hope, be obvious after a little thought that only half of each crossing can be sawed this way and for the other half the wheel must be transferred to the other side of the table and the saw held in the left hand. This needs more ambidexterity than I have, so I simply reversed the blade in the frame, so that the teeth faced inwards towards the frame, and sawed backwards towards myself. (See Fergus’s comment) Figure 14 shows the results in an early, practice attempt to assess the practicality of making the crossing by hand. Figure 14: Ready to file again. The rest involves filing to the lines. The closer one can saw to the lines, the less filing is required. Swiss needle files are needed and there is a particular form used for crossing out and it is called a crossing file; both surfaces are curved with different radii and tapering to a point, so with care, finely rounded internal corners can be cut. A crochet file is useful for getting into sharp corners as it is tapered in width and in length. Again, a powerful aid to vision is very helpful. A close inspection with a microscope in good light will show all manner of burrs and the simplest way of removing them from corners is to lightly draw the blade of a small craft knife across them, taking great care to avoid the faces and tips of the teeth. Each face of the wheel is easily polished by rubbing against a piece of wet and dry emery paper resting on a scrap of plate glass under water to which a drop or two of washing up liquid has been added. I start with 800 grit and finish with a piece of well-worn 1200 grit, taking the polishing no further, as these faces contact only air. The acting faces of the teeth were left with a very fine finish by the fly cutter, but I felt that the locking and impulse jewels would have an even smoother ride if polished (Figure 15). The figure shows how I held the wheel, by now with its collet in place. In a block of wood that I could hold comfortably in my fist while it rested on the bench, I let in a piece of pivot steel and held the wheel stationary with an index finger, while polishing the faces under direct vision with a scrap of diamond-impregnated film glued to an old feeler blade. I went from 9 to 3 micron film and decided that was far enough. Figure 17 shows the original wheel with a couple of trial wheels, with the one on the left nearly good enough, but as the rim at the top is a little irregular, I decided to finish with a spare one of the dozen or so that I had parted off at various stages of my trial. I had fitted this to the chronometer before I thought to photograph it, and as the chronometer has now run for over 24 hours with a gain of 1.7 seconds with an excellent action and the mainspring set up only two turns, I am not about to take it apart for a photograph. The final version is seen in Figure 15. Figure 16: A compendium of escape wheels. If you compare the finish of punched out edges, as shown in Figure 1 with the edges left by filing in Figure 15, there is surprisingly little difference (Figure 17). Figure 17: New (right) and old (right) wheel finish compared. My teeth probably have more mass than the originals , but the rim is a little finer and the mass of the spokes is concentrated nearer the centre, so that the inertia, mr², of my wheel is probably about the same. Making the collet was a simple turning operation, albeit at a small scale and industrial glues have made interference fits and riveting of collets unnecessary. Finally, Figure 17 shows a Soviet MX6 escape wheel being refitted to its arbor. 18: Fitting an escape wheel to its arbor. I hope you enjoyed reading this post and if you haven’t already done so, I encourage you to buy my book, available from amazon.com. 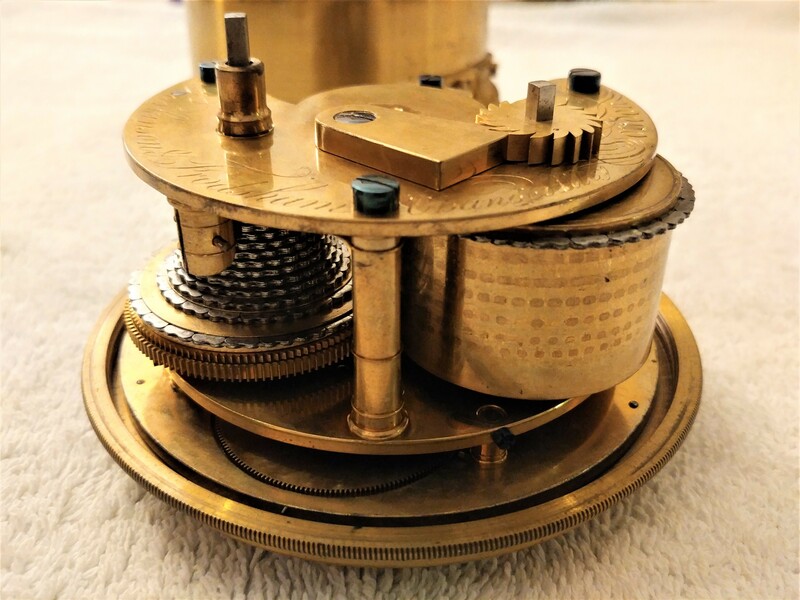 It may well tell you more than you wish to know about the structure of the marine chronometer. A note on finding your way around this site: If you know what you are looking for, you can enter a search term in the search box. You can also look in the “List of Posts” to get a date and either click on that date or enter a search term. In my post Number 8 of July 30, 2013, I wrote about how to make one form of tipsy key. Recently, to amuse myself, I have bought shipwrecked chronometers and tried to bring them back to life. 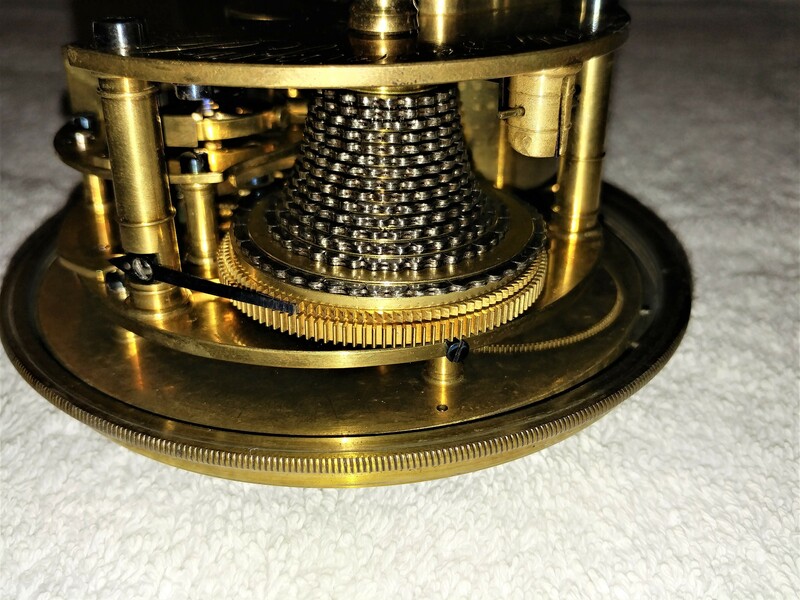 Currently, I am working on a Hamilton Model 21 chronometer which seems to have been dropped, probably while out of its bowl, as all the pivots of the balance and escape wheels are broken and the track on the fusee for the chain has been damaged. Two of the hole jewels of the escapement are also badly chipped and the locking jewel has been broken. While waiting for replacement jewels, I have occupied some time by cleaning the rest of the chronometer and making a new key for it. Since a lot of time is spent setting up for machining parts, it is sometimes almost as quick to make two parts as to make one and this is what I did. Figure 1 shows two tipsy keys that use clutches to prevent winding a chronometer clockwise. 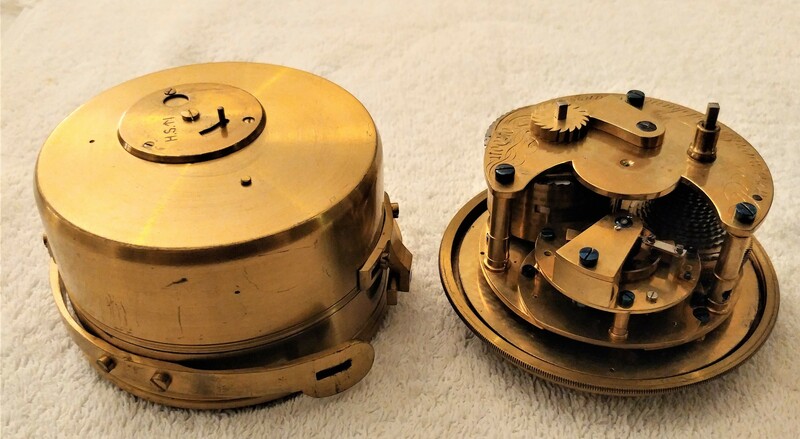 The one on the left is from an antique Mercer chronometer that perished when the Australian city of Darwin was largely destroyed by Typhoon Tracy in 1974 and the one on the right is from a German Einheits-Chronometer of 1943. The latter still keeps an excellent rate. Figure 2 is a composite drawing of the interior mechanism of the second key, while subsequent drawings of the separate parts give the dimensions of the parts as I made them. I had to alter some of the dimensions of the knob so as to use what I had available in the way of brass stock, but as long as the square hole fits the winding square of the chronmeter, the dimensions do not have to be identical to the original. Figure 2: The interior of the key. The clutch teeth on the end of the winding shaft inside the conical body are held in engagement with the teeth on the knob by means of a short helical spring. The teeth are sloped so as to slip if the knob is turned clockwise but to engage if turned anti-clockwise. 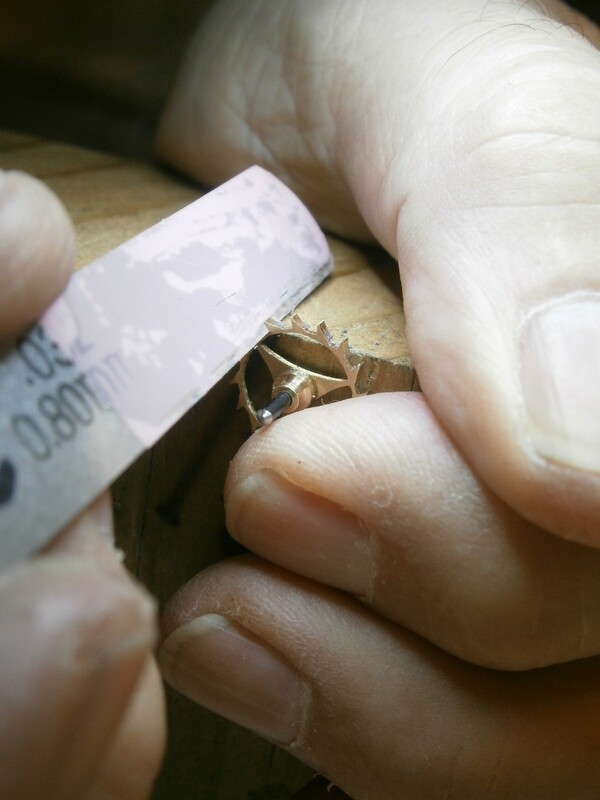 It is a simple turning exercise to make the shaft (Figure 3), by turning down a piece of 8 mm stock to 6 mm, drilling the end to a depth of about 25 mm to a diameter equal to the across-flats dimension of the chronometer winding square, and parting off. Figure 3: Drawing of shaft. The round hole then serves as a guide to convert the round hole into a square one, while the depth of the hole allows a square needle file to get a decent grip on the metal. The nearly completed filing is shown in Figure 4. Of course, those lucky people who possess small broaches could use them and it is also possible to drill square holes with an appropriate attachment to the drilling machine. Figure 4: Converting a round hole to a square one. For the body, I turned down a piece of 20 mm round brass bar to 18 mm, drilled and reamed the centre hole to 6 mm and followed the 6 mm hole with an 8 mm slot drill to form a flat-bottomed hole as shown in Figure 6. As I was making two keys, for each tool set up I switched ends of a length of bar. Figure 6: 8 mm hole counter-bored. The top slide is then set over to 12.5 degrees and the conical outside generated (Figure 7), before parting off to length. Technically, I suppose the shape should be described as a frustrum of a cone. Figure 7: Generating conical shape. I postponed drilling and tapping the M3 (or 6 BA would do) holes until the knob was made. Thirty millimetre stock would have been better than the 26 mm I used, as it would have given me a key with a bit more leverage. Figure 9: Turning diameters of knob. Making the knob begins by turning the 8 and 20 mm diameters shown in Figure 8. The bar is then set up in a vice on the milling machine to form the flat parts of the knob (Figure 10). This is perhaps a good spot to point out that tools for cutting brass need to be sharp and preferably reserved for use only on brass, as once they have been used on steel they tend to skid over brass. The second flat is formed by rotating the bar through 180 degrees and checking with a micrometer that the surfaces are parallel before making the final cut on the second surface. While it was still attached to the bar, I used a simple template to mark out the complex shape (Figure 11), before cutting around it using a piercing saw. No doubt it could be machined using some sort of computer-aided process, but with a little practice and a sharp saw blade it is much quicker to cut it by hand and finish off with sharp files. Figure 11: Using template to mark out for sawing to shape. This is perhaps a good moment to drill holes at tapping size for the screws in the knob. They will be used to spot the holes in the body and then enlarged to a clearance size later. Next comes the machining of the clutch teeth, and it needs some thought and care to make sure that they slope in the correct direction! The knob can be held by the flats in a machine vice that tilts. I guessed that the teeth tilted at 30 degrees, but 25 degrees would have given more clearance for the side of the 3 mm diameter end mill at the end of its cut (Figure 12). Figure 12: Clutch tooth being formed. The same set-up is used for the teeth on the end of the shaft, as shown in Figure 13. Figure 13: Milling teeth on shaft. After cleaning off burrs with a fine file, the key can now have a trial assembly and a spring cut to length so that the teeth are held in engagement and that there is enough free space for them to slip when turned clockwise. Drilling for the tapping holes in the body presents minor problems, as its shape prevents it from being held in a vice. I got around this by assembling the key, holding the shaft in a drilling vice and rotating the body until the teeth were locked, then drilling the hole to full length. Though brass is traditionally cut dry, it is a sound plan to use a little lubricant when tapping the holes, as there is a tendency to jamming unless the taps are sharp. Most of us cannot afford to keep two sets of taps, one for sole use on brass, so a little lubricant may save a lot of heart ache due to a work piece having to be scrapped because a broken tap is jammed in it. A little grease and assembly with a couple of countersink-head screws completes the key (Figure 14). Figure 14: Two new and two old. I hope this account was of interest to you. 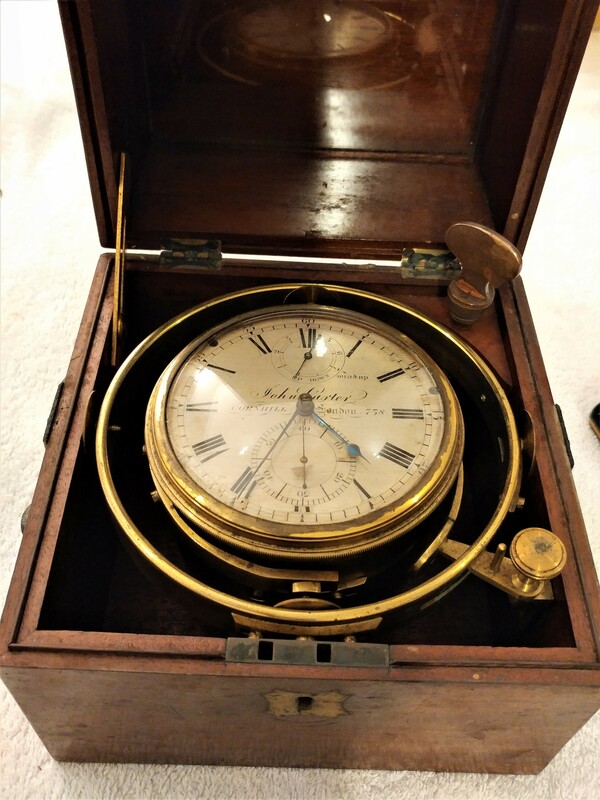 You will find much more about marine chronometers in my book. Take a look at “About the Mariner’s Chronometer”. Apart from Soviet era MX6 chronometers other chronometers are out of my financial reach, unless I buy damaged ones “for parts or repair”. As I now have several MX6 s I can only justify buying another if I challenge myself to right the wrongs it may have suffered. At the beginning of October I returned from the USA with a homeless MX6, of which the seller had said it would not wind beyond 48 hours, whereas 56 hours is the norm. The Department of Homeland Security had rummaged through my baggage, presumably upon seeing with X-rays a dense circular object with clockwork, and had replaced the layers of bubble wrap after a fashion, so further damage had not occurred. Once recovered from a 15 hour flight from Houston to New Zealand, followed by a 5 hours drive to my home in the Far North, I set about exploring the innards of the instrument. The end of the chain around the barrel was at the back and the clock ran when started, so, rather incautiously, I wound the clock to 48 hours and continued, forgetting that the stop-work needs a full wind to operate. There came a loud snapping noise followed by a frenzied whirring…Upon opening the machine I of course found that the barrel end of the chain was no longer attached to the barrel, but of a hook there was no sign (Figure 1 – click on the photo to enlarge and use back arrow to return to text)). The barrel arbor had cast off its ratchet, so happily the whirring had come from the barrel rather than from the movement. Figure 1: Broken and short chain. Note how the chain, even if it had had a hook, is still one turn of the fusee short of reaching the stop bar. It seems that someone, not necessarily the seller, had simply stuffed the broken end of the chain into the barrel slot. In any event, when the chain lost contact with the barrel, either the free end or the recoil of the movement had done a lot of damage. The moral of the story is that you should not wind an obviously defective chronometer to see whether it goes. It should have been obvious to me that a bit of the chain was missing and that the stop work would not operate, risking breakage of the chain at the end of winding if it had a hook into the barrel or, as I found out, the chain simply let go of the barrel. The chain was about 120 mm short of the required length of 850 mm and I replaced it with steel cable as described in post number 27 of 13th February, 2017. Once fully dismantled, I found that the upper pivot of the escape wheel had been repaired by the classical method of drilling down the broken end and letting in a new pivot. The new pivot was rather short and it had not needed much to knock it out of place. I had a spare escape wheel arbor and pinion which had a broken upper pivot and I used my preferred method of repair, by using a muff, as described in post number 7 of 22nd July, 2013. Using the classical method, if the tiny drill, around 0.6 mm in diameter, breaks off in the broken arbor, you may not be able to get the broken stub out of the hole and, it being made of high speed steel, you won’t be able to drill it out. That was the easy bit. The detent spring, which must have been intact when I first tried it, because the clock ran, had taken on a Z-shape. At least it was not broken, and the fact that it had distorted without breaking gave me some hope that I might be able to straighten it. While is was possible to straighten a passing spring by drawing it between my finger nails (see post 22 0f 20th June 2016), the detent spring is made of sterner stuff and so I used a pair of pliers with circular jaws, bending the spring while drawing it between the jaws, as shown in Figure 1, which is posed with a slip of brass shim between the jaws. Figure 2: Technique to straighten spring. Drawing the spring between the jaws, while angling the pliers against the bend, irons out any kink, so that a reverse bend is not simply added to the original bend. Eventually I managed to get the spring straight again without breaking it. The next step was to replace the passing spring. While some chronometers had oval holes in the passing spring to allow for some adjustment, in the MX6, there is no provision for this and the tip of the passing spring projects rather less than a millimeter beyond the tip of the horn. This means that in adjusting the depth of the detent, this is the total range of available movement and in lifting the passing spring the discharging jewel must pass clear of the tip of the detent. On the return, the jewel must lift the locking stone off a tooth of the escape wheel far enough to unlock the wheel. If the locking stone is too deep in the escape wheel teeth, unlocking won’t happen, so some adjustment of the banking screw (or stop button in the Hamilton M21 escapement) may be necessary. It seems to be about right when a tooth of the escape wheel overlaps about one third of the width of the jewel face. In making these interdependent adjustments, I start with the locking stone and check that every tooth of the escape wheel is locked by this amount, just in case the upper pivot is bent or for some reason there has been uneven tooth wear. Once I have done this, I then start with the tip of the detent well clear of the discharging jewel and move it in very gradually, operating the escape wheel with a finger until the passing spring is lifted off the horn of the detent. Only then do I check that unlocking takes place on the return stroke. If the depth of the detent is set too deep, the discharging jewel will strike the back of the horn on the return, instead of the passing spring, and refuse to go further because the banking screw stops it, a very good reason for checking the operation of the escapement by hand, rather than under power, which would risk breaking the discharging jewel or a balance wheel pivot. Then one can wind the chronometer a turn or so and let it run under power, being prepared to stop it at the first sign of tripping, which is usually cured by increasing the depth by a tiny amount each time. This of course assumes that you have not disturbed the mutual angles between the upper balance wheel spring stud, the discharging roller and the impulse roller, another interdependent set of adjustments. I knew that I had all the angles correct and it needed less than an eighth of a turn of the depth-adjusting screw to cure occasional tripping. Despite all its trials, the chronometer responded to my ministrations and ran sweetly on a full wind. After some adjustment, it ran over 20 days with a mean gaining error at room temperature of 0.9 seconds per day, with the mean of the deviations from this mean error being 1.03 seconds. Making a case for it took a little while, but it seems happy enough in what I was able to achieve (Figures 3 and 4). Figure 3: Exterior of new case. I was able to use some Hamilton handles, but the gimbals lock and the brass corners I had to make myself. Figure 4: Chronometer in new home.